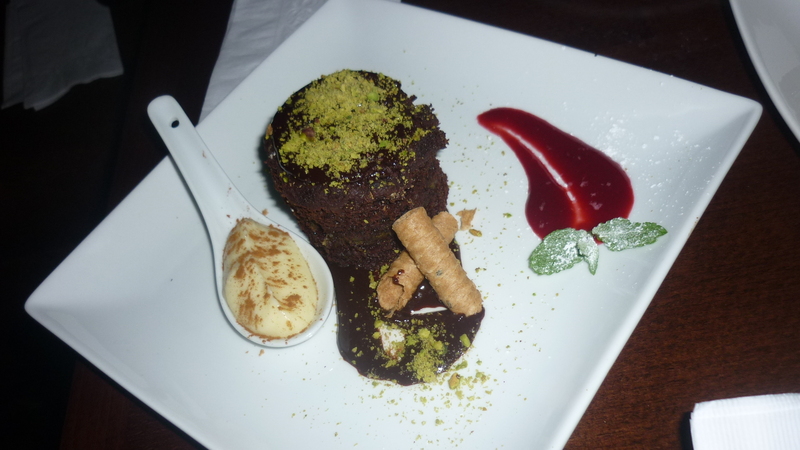 DL Restaurant & Lounge: A Secret Too Good to Keep! In popular slang, the initials “DL” are commonly understood to stand for “Down Low,” indicating something that should be kept secret or given a low profile. In a neighborhood that’s quickly developing its own Restaurant Row (see Essex Street), The DL is a recently opened restaurant / bar located at the corner of Delancey and Ludlow Streets – the DL moniker deriving from this intersection – serving remarkably delicious food and offering a hip dining alternative completely free of any oppressive hipster attitude. Even if you’re reading about The DL for the first time in this review, once word gets out, we can envision this place being one of the most buzzed about dining spots on Manhattan’s Lower East Side. One of the first things you’ll notice on entering The DL is how gorgeous the room is. 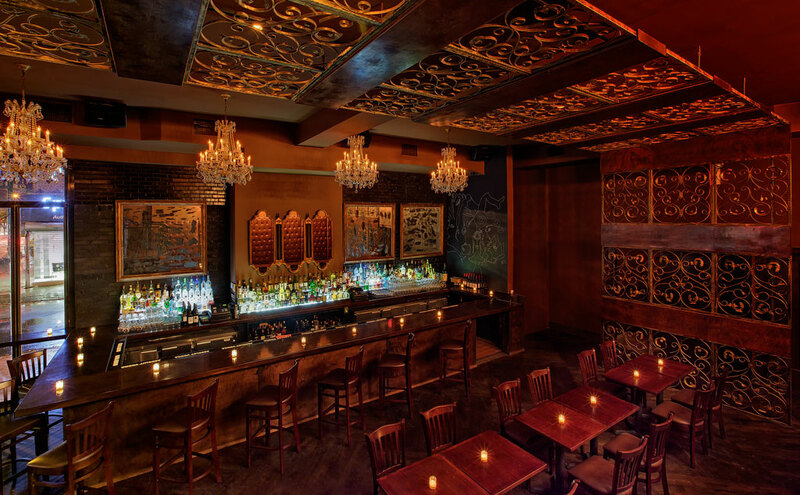 Bordered by floor to ceiling glass windows, the open-plan space features a long bar and plenty of intimate tables and banquet-lined booths amid a gothic elegant décor of crystal chandeliers, dark wood and ornate metal filigree that lends an attractive nightclub feel to the room without sacrificing a cozy vibe. DL’s menu, presented tapas-style on small plates, showcases a varied selection of modern American comfort foods that manage to be both wildly innovative and pleasingly familiar. Plan your visit with one or more friends so that you can share and sample a variety of dishes. Shown: Half Portion. All Food Photos By Anne Raso. 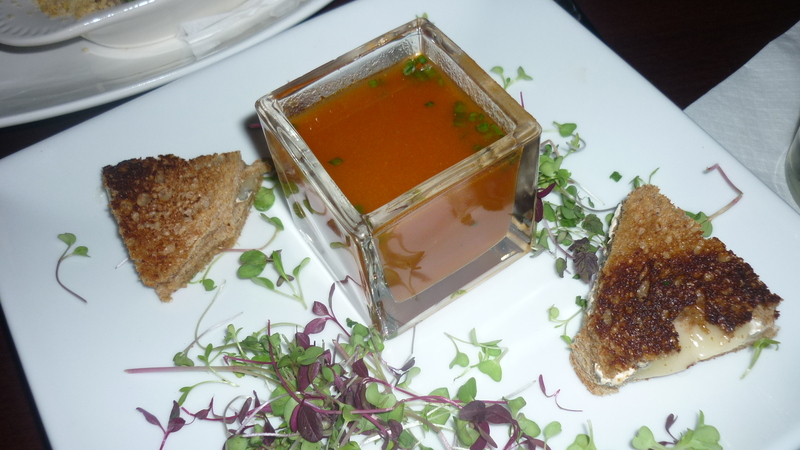 An American classic combination, DL’s Grilled Cheese Sandwich served with a cup of heirloom tomato soup ($12.00) features Humboldt fog, a creamy goat’s milk cheese on 12-grain toast, and the warming soup has a slightly peppery kick to it. Our server was happy to request that the portion be split for two so that it could be easily shared. 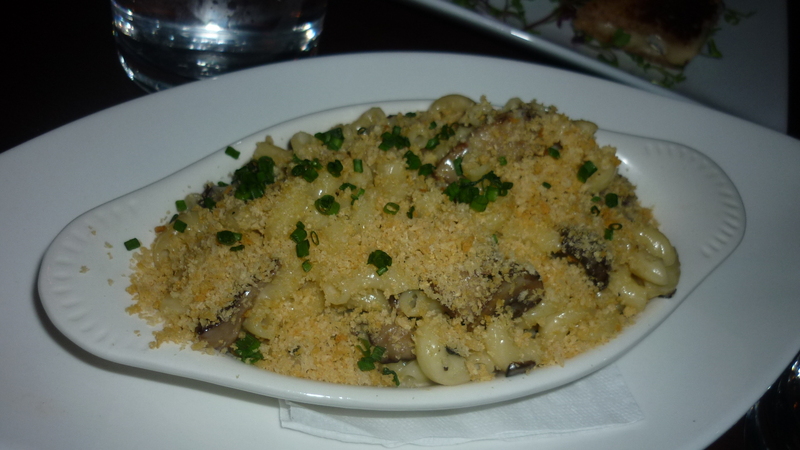 Everyone loves macaroni and cheese, and The DL does their Ludlow Mac (Elbow macaroni, with creamy béchamel sauce and cheese) three ways: Lobster and Chive ($16), Bacon and Green Apple ($14) and Truffle and Mushroom ($15), which was our selection. This is a classically oven-baked dish with crispy panko crumb topping and the plentiful slices of fresh mushroom added a complimentary flavor boost to the rich, truffle oil-infused sauce. A sampling of all three Ludlow Mac varieties can be ordered for $24. 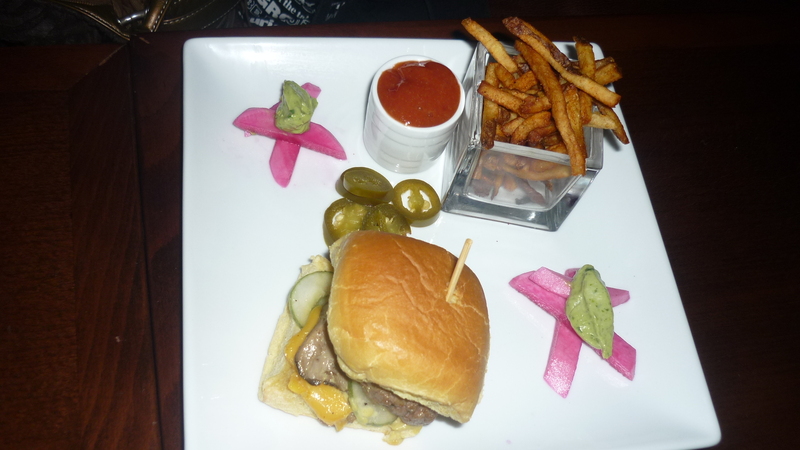 The slider-sized DL Burger was perfectly juicy, topped with cheese and crisp pickle on a fresh potato bun, with jalepenos, pickled turnips & avocado puree garnish and a side of extra crispy fries ($12.00). Had this been a full-sized burger it would certainly be among the best in Manhattan, the dry aged ground beef being excellent quality and the burger having an appealing char-grilled taste! If you plan on sharing ask for a sharp knife to cut the burger evenly in half, otherwise it could get a bit messy. 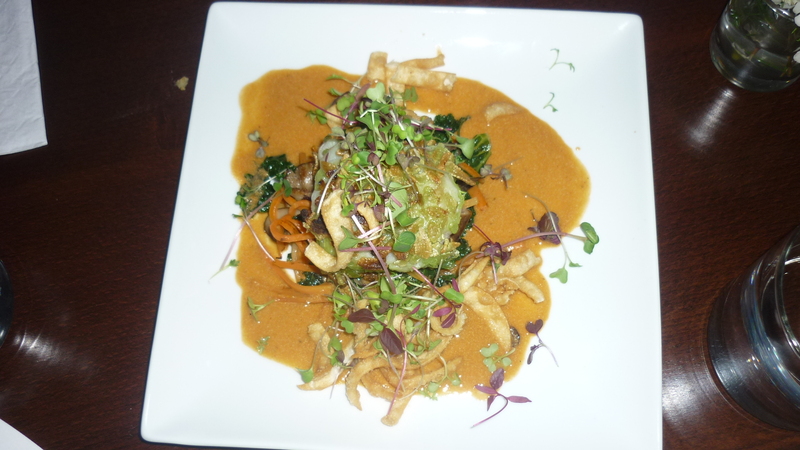 For fish lovers, we recommend the nice-sized portion of mild-tasting Rice Crispy Crusted Monkfish served with sautéed vegetables, crispy rice noodles and a flavorful Lobster broth accented with fresh baby coconut milk ($15.00). 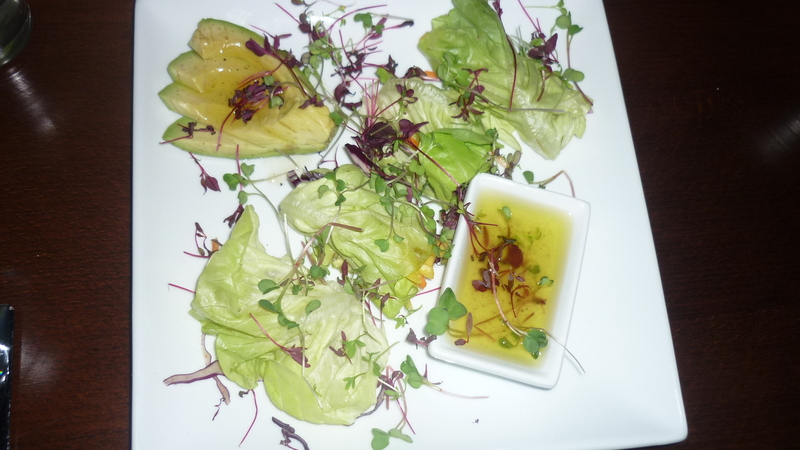 A playful take on traditional green salad can be found in the Green Leaf Salad Rolls, where bib lettuce is wrapped around avocado, mango and julienne vegetables and served with a really unique sweet and tart citrus dressing ($11.00). 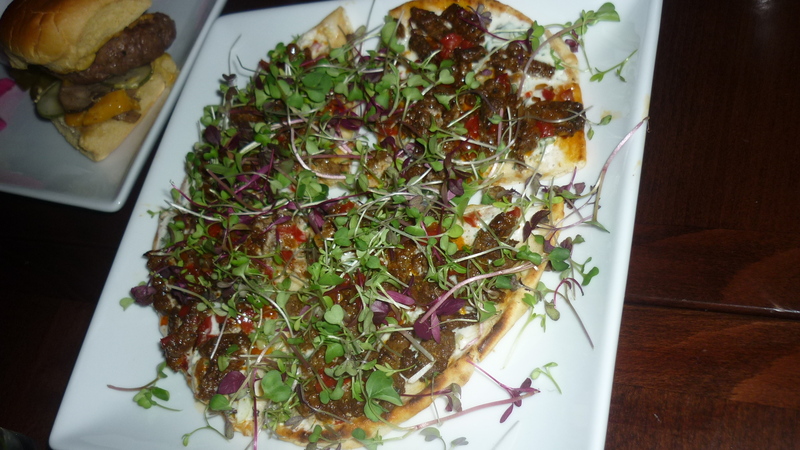 One of the house specialties, the middle eastern-style Merguez Pizza is served on a grilled soft flatbread topped with crumbled house-made lamb sausage, greens and fresh tzatziki sauce ($14.00). Perfectly spiced with hint of fresh fennel, this creation reminded us more of a tasty flatbread gyro than a traditional pizza. 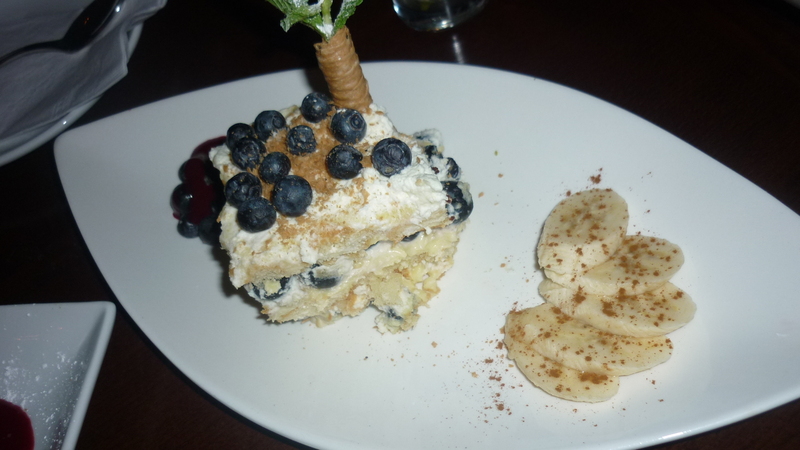 For dessert, we were easily tempted by the Blueberry and Banana Pudding Tiramisu ($10.00). Aside from being a scrumptious dessert comprised of layers of cake and custard, this fresh fruit studded delight bears little resemblance to its namesake flavor-wise, but is nevertheless fantastically delicious. Service from both our waiter and the restaurant’s accommodating Maitre D’ was exceptionally friendly and attentive in every way. Chef Wesley Wobles (formerly of Cafe Del Mar, among others) even made a stop by our table to ask how we were enjoying the food and to chat with us briefly about his approach to cooking with fresh, local ingredients. With his delicious, creative cuisine and fun personality, we think Wesley would make an ideal contestant for Bravo TV’s Top Chef! The DL is located at 95 Delancey Street (Southwest Corner of Ludlow and Delancey) in New York City. Happy Hour Drink specials are featured nightly from 5 – 8 PM. Reservations (starting at 5 PM) can be made up to thirty days in advance. Please call (212)228-0909 for all information regarding dinner and table reservations. Visit The DL on the Web at This Link. Love the decor in that restaurant!